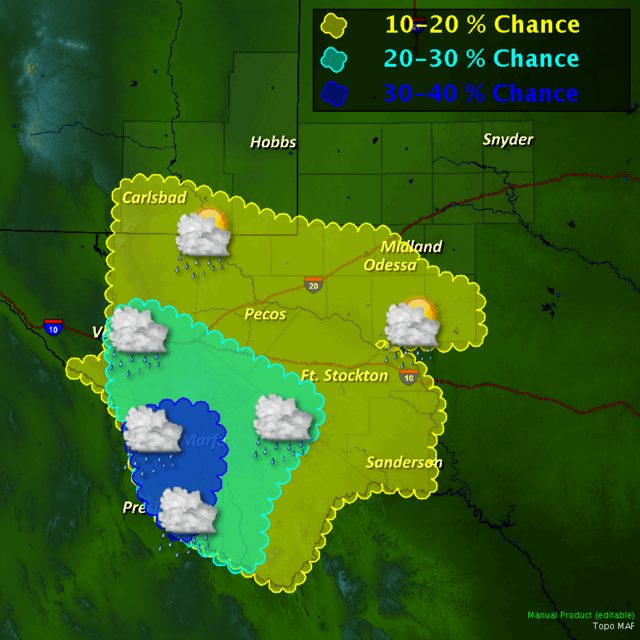 Map is Courtesy The Midland NWS Office. RUC 500 MB (18,000' MSL) Analysis At 5 AM MST. Upper-level Storm Passes To Our South Today. A few light rain showers broke out over the area overnight and this morning. As was expected the totals have been light and confined mostly to the mountains. Here are some of the totals that have been reported as of 7 AM MST. 4.9 Miles NNE of Cloudcroft .22"
Sacramento Peak Raws - Sunspot .21"
2.3 Miles S of Cloudcroft .21"
Cosmic Raws - Apache Point Observatory .19"
4.0 Miles E of Cloudcroft .14"
0.4 Miles ESE of Cloudcroft .10"
Smokey Bear Raws - Near Ruidoso .09"
Mescal Raws - Near Mescalero .06"
0.8 Miles SE of High Rolls .05"
Sierra Blanca Regional Airport .01"
2.1 Miles NNW Downtown Carlsbad .01"
Like yesterday morning, our low temperatures this morning have been unusually mild. Once again a continuous stream of mid-high level cloud cover has acted as a blanket and kept our temperatures up. Listed below are some of the warmer overnight low temperatures reported as of 7 AM MST. 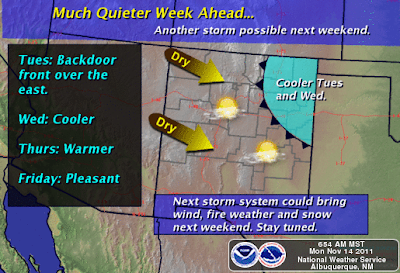 Another mild fall day is on tap for the local area today and tomorrow. High temps will mostly be in the low-mid 70's. A cold front will arrive late Tuesday night or early Wednesday morning, and this will knock our daytime highs back down into the low-mid 60's on Wednesday and Thursday. Our temperatures will rebound by Friday with highs in the mid-upper 70's returning. Our next weather maker will arrive this weekend. A short wave trough of low pressure at the mid-upper levels of the atmosphere, is forecast to move across northern New Mexico and southern Colorado this weekend. So, with this storm taking the northerly route, we can expect to see more wind across eastern and southeastern New Mexico this upcoming weekend. Watching The Arctic Outbreak & Next Weeks Storm. North American Surface Temps At 11 PM MST. I have been talking about an unusually cold (for this time of the year) arctic airmass that is currently located over northern Alaska and northwestern Canada since last week. This airmass originated in Siberia, and continues to work its way eastward, and will eventually slide southward into the northern US. Arctic Village, which is located in northeastern Alaska, was reporting a low temp of -36F as of 6 AM MST this morning. If you click on the map above, and look at the temperatures (as of 11 PM MST last night) across most of northern Alaska and northwestern Canada, you will see the huge area of -10F to -30F temperatures that covers that area.The green shading indicates temperatures of -40F or colder. 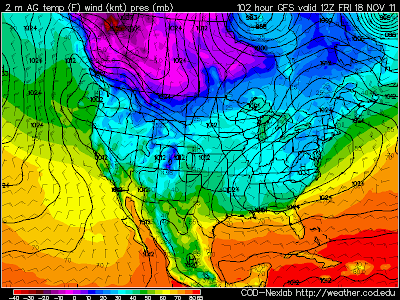 06Z/11 PM GFS SurfaceTemperature Forecast Map. Valid At 12Z/5 AM MST Fri Nov 18, 2011. Last nights 06Z/11 PM MST run of the US GFS forecast model, indicated that by around sunrise this Friday morning, the 0-degree F line would be knocking on the northern Montana border. This may be a little early or even late...the models sometimes struggle with the timing and strength of dense arctic outbreaks. Even so, it is becoming more certain that this bitterly cold airmass is coming south into the US. 06Z/5 AM MST GFS 500 MB (18,000' MSL) Forecast. 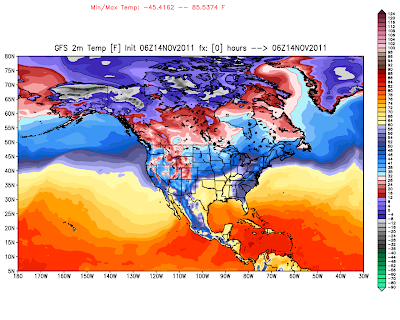 Valid At 5 12Z/5 AM MST Fri Nov 18, 2011. 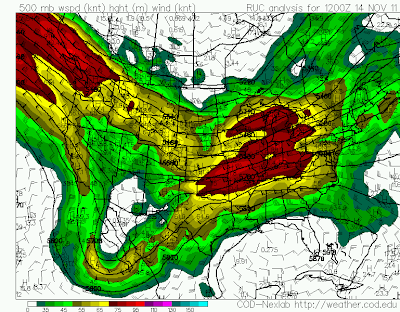 Life is about to get interesting over the Western US late this week into next week. Last nights 06Z/11PM MST run of the US GFS computer model, was forecasting a deep and cold upper-level storm to drop southward out of the Gulf of Alaska, and into the Great Basin by this weekend. The models are also forecasting this strong upper-level storm to continue digging southward, and into the Desert Southwest by the first of next week. 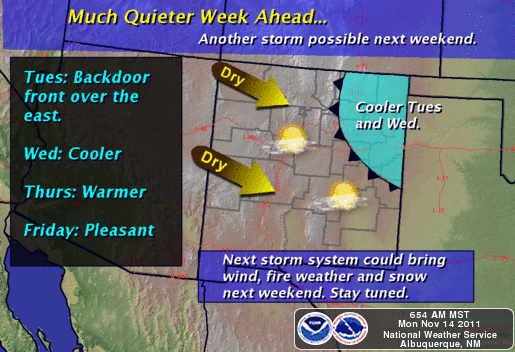 So it appears that our weather is going to become very interesting across New Mexico next week. Just how far south does this upper-level storm dive, and how much of an impact on our weather will it have, is still unknown at this point in time. Keep checking back here and I will keep you updated on the very latest on this developing weather story.